Jameis Winston's ankle injury has not kept him off the field in practice or preseason games. TAMPA, Fla. (AP) — Jameis Winston has a sprained ankle that the rookie quarterback and Tampa Bay Buccaneers say is not a major concern. 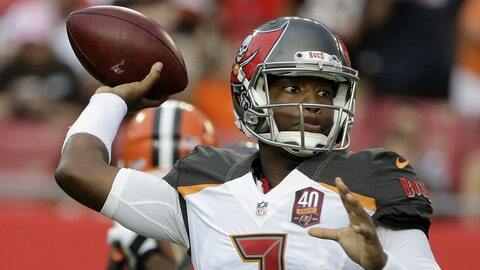 Winston twisted his right ankle during the Bucs’ second preseason game on Aug. 24. The injury has not kept the No. 1 overall pick in the NFL draft off the field. In addition to playing into the third quarter of last weekend’s 31-7 loss to the Cleveland Browns, Winston continues to practice. "Pain is temporary. I really don’t focus on that at all," Winston said Monday. "I played last year at Florida State with a sprained ankle, so that’s the least of my worries. My job is to go out there and play quarterback and fight for the team." Coach Lovie Smith has been noncommittal about how much, if any, the 2013 Heisman Trophy winner and the rest of Tampa Bay’s regulars might play in Thursday’s night preseason finale at Miami. "He’s come a long way for a rookie quarterback," Smith said, remaining coy about the plan against the Dolphins. "We feel real good about where he is." Offensive coordinator Dirk Koetter said the ankle sprain has affected Winston "a little bit," but that the young quarterback should be ready for the season opener against Tennessee on Sept. 13. "It’s not anything he can’t play on," Koetter said. "Even in practice, you can’t keep him out. … We’ll get him healthy. He’s got a sprained ankle. If you’ve ever had one, and you have to move around, it can be painful." Winston has completed 48.9 percent of his passes for 311 yards, no touchdowns and two interceptions in three preseason games. He’s run for two TDs, but also been sacked seven times. The rookie limped off the field after a sack against the Bengals, although he and Smith played down the severity of the injury after the game. A revamped offensive line featuring three new young starters — two of them rookies — also struggled to protect Winston against the Browns, who used a variety of blitzes to pressure the quarterback. "As an offense in general, we took two steps forward against Cincinnati and we took a step backward in this last game," Koetter said. "There were so many breakdowns across the board. … One thing after another went wrong. Not all Jameis’ fault." Winston called the poor outing against Cleveland a learning experience. He also said his ankle was not a factor against the Bengals.